Whitney Vickers | Greene County News Home school students gathered at the National Museum of the United States Air Force Monday, April 1 for Home School STEM Day, which included STEM-related classes, presentations, demonstrations and more that were geared toward home school students and families. A museum volunteer demonstrates how gravity works. A student flying a plane through virtual reality with a retired Air Force pilot standing by ready to give instructions. 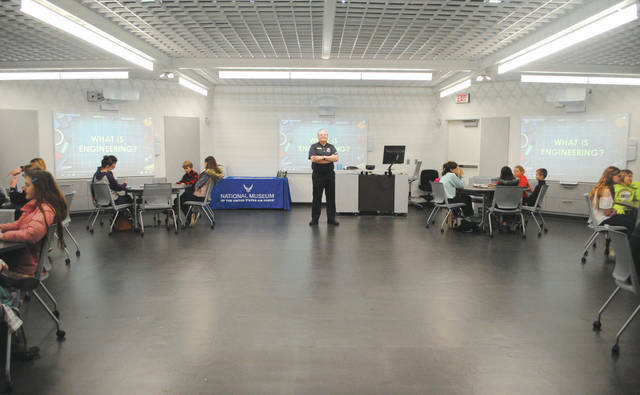 The STEM Learning Node at the Air Force Museum was home to several classes during the event. The STEM Learning Node is modeled after the International Space Station. 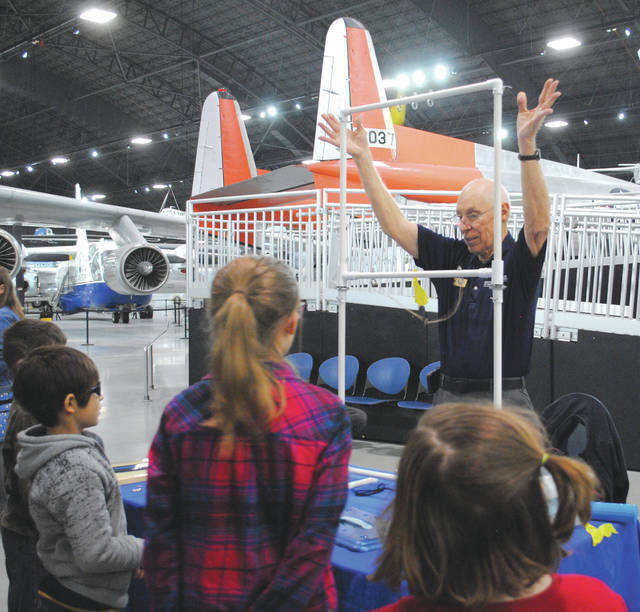 WRIGHT-PATTERSON AIR FORCE BASE — The National Museum of the United States Air Force invited home schooled children in kindergarten through 12 grade to the grounds Monday, April 1 for Home School STEM Day. Local students had the opportunity to participate in a number of science, engineering, technology and mathematics (STEM)-related activities such as hands-on demonstrations, stories, presentations and more. Home School STEM Day is hosted twice per year: once in the spring, once in the fall. In-between, the museum hosts a monthly Family Day held once Saturday per month that highlights a specific theme. Neither events cost to attend nor do they require advanced registration. Students participating in Home School STEM Day also had the opportunity to try Virtual Reality, which Brimmer said is the “latest and greatest technology.” Children lined up to put on headphones and fly a virtual airplane with a retired Air Force pilot, who volunteers for the museum, standing by ready to provide instruction. Classrooms within the museum, such as the STEM Learning Node, were opened up for Home School STEM Day to host various activities. Museum officials said the STEM Learning Node is modeled after the International Space Station and includes smart boards, speakers and more. Young participants enjoyed story times that highlighted launching to the moon and being an engineer, respectively, and created crafts related to the stories. Older attendees were invited to take a class highlighting circuits, as well as helicopters, the forces of flight and using math to complete a rescue mission. Eldest Home School STEM Day attendees were invited to take a class highlighting the engineer design process. They were also welcome to hear a presentation about the Holocaust which invited individuals who experienced it first-hand, or close family members, to tell their story for participants to hear. Museum Volunteer Rene Frydman, who serves as the Holocaust exhibit curator, said the program stresses the importance of understanding what hate and prejudice can do. She added that offering the program during Home School STEM Day offers a humanities aspect to the event. Attendees were also offered age-appropriate scavenger hunts. Some scavenger hunt sheets offered word searches and puzzles, while others had questions. Brimmer said the scavenger hunt sheets are available not only during Home School STEM Day, but anytime the museum is open. The museum will host events in the coming months to commemorate the 75th anniversary of D-Day as well as the 50th anniversary of The Apollo Missions — first moon landing. The next Home School STEM Day is planned for Monday, Oct. 7.
https://www.fairborndailyherald.com/wp-content/uploads/sites/50/2019/04/web1_stemday2.jpgWhitney Vickers | Greene County News Home school students gathered at the National Museum of the United States Air Force Monday, April 1 for Home School STEM Day, which included STEM-related classes, presentations, demonstrations and more that were geared toward home school students and families. https://www.fairborndailyherald.com/wp-content/uploads/sites/50/2019/04/web1_stemday3.jpgA museum volunteer demonstrates how gravity works. 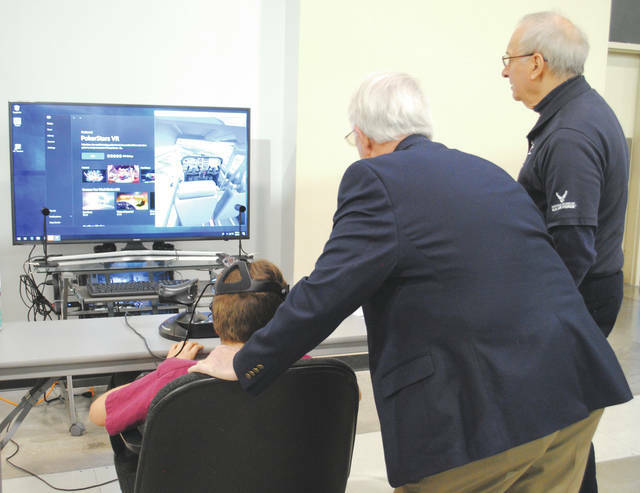 https://www.fairborndailyherald.com/wp-content/uploads/sites/50/2019/04/web1_stemday4.jpgA student flying a plane through virtual reality with a retired Air Force pilot standing by ready to give instructions. 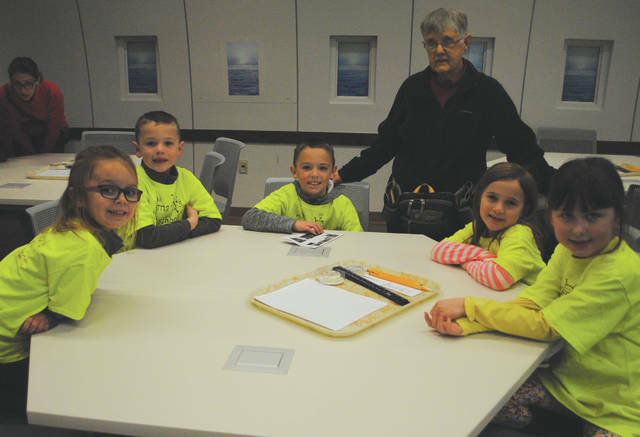 https://www.fairborndailyherald.com/wp-content/uploads/sites/50/2019/04/web1_stemday1.jpgThe STEM Learning Node at the Air Force Museum was home to several classes during the event. The STEM Learning Node is modeled after the International Space Station.